So far my experiments with sipgate VoIP have been good. The next step has been to buy an adapter that will convert our home phone into a VoIP phone. There are two reasons for this. Firstly, the sipgate softphone is fine for me when I’m using my laptop but it doesn’t have the same convenience of picking up a phone and dialing. Secondly, we make quite a few calls between the family (my house, mums house and the office) and all those calls soon add up. If VoIP works, we should be able to call each other for free (or at least no more than the one off hardware costs). Just making and receiving VoIP calls isn’t the whole objective though, I need our home phone to continue to ring on our home phone number. We’re still keeping the line (it’s our broadband connection too) and many of our friends know to reach us on this number. So, I wanted to use VoIP when it works for us, and our traditional line if ever it doesn’t. This is where choosing the right adapter comes in. I had to find an adapter that had an FXS port, and FXO port and an ethernet port. What do all these acronyms mean? Your normal analog phone plugs into an FXO port (eg the BT Plug on the wall) You could think of the O meaning ‘office phone system’ if you like, or perhaps ‘O’h what a big phone company. I needed an adapter that had both an FXO port (so I could plug our regular phone into it) as well as an FXS port (so the adapter could be plugged into the wall like a normal phone). Via the Ethernet cable it gets plugged into our home network (and onto broadband internet via our home router). The adapter has to log into the SIP service (sipgate in my case) so that it can receive calls over VoIP. You’ll notice that from my earlier post I now appear to be online( ) all the time. That’s because our home phone is logged into sipgate ready for the next call. Anyway, onto which adapter I chose. I found a linksys SPA3102 which had all the required features. It’s the latest incarnation of devices from a company once called Sipura who specialise in Voice of IP products. Sipura were bought by Cisco (Cisco are big in business networks, Linksys is their lower end home/small office brand of networking equipment) and are now a part of Linksys. 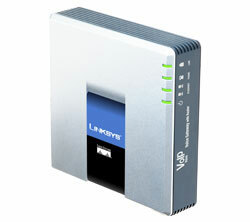 Most importantly I could find users with some experience of the linksys/sipura devices amongst various forums. Although lots were having problems and there seemed to be a fair few needing to do or waiting for firmware updates, many of the replies were giving solutions. I am always more worried when there is a a lack of forum/troubleshooting activity than I am to see it, I don’t like being at the leading edge of technology any more than I have to and forum activity shows a product is being well used. It was also within my budget (free wasn’t an option, but the 50 price tag was close enough for me to give it a whirl). Being part of the huge Cisco corporation probably isn’t a bad thing either, at least I can have an expectation that the device will be around and supported for a while. I consider myself a pretty network savvy person but this little grey box (photo at the top) had me confused for several hours. Step 1: open the box, gasp in awe at the simple instructions. Step 2: plug the provided wire from SPA3102 into phone, plug original phone wire from SPA3102 into BT wall outlet (well, actually, the broadband filter but let’s not get picky). Step 3: wonder why there is no dial tone and nothing happens. Step 4: decide it must need to be enabled from within the web interface. The next problem was entirely of my own making. I departed from the instructions. The device has TWO ethernet ports. one for “internet” one for “computer”. Now, if I had a cable modem that presented an ethernet port as it’s connection to the world I could probably follow this part, but I, along with many others have ADSL and a wireless router. I plugged the “internet” part into my router and didn’t bother moving my PC’s ethernet wire from the router to go via the SPA3102. I couldn’t connect to the web interface, I couldn’t hear any dial tone on the phone (the instruction said I could configure things through a voice menu). I could see the unit had collected it’s IP address from my router but I just couldn’t connect. Step 7: Realisation dawns that it is already configured to give the regular phone a dial tone. I don’t hear a dial tone…. “Houston, I have a problem”. Is the unit faulty? Not likely, electronics are pretty good in my experience, it’s normally something obvious… like the wire. Unplug everything and look very closely… yes, it’s the wire! The wire they provided is an RJ11 plug. It’s a small squareish plug with 4 wires, or at least 4 slots where wires can connect. Except telephones only use 2 wires. My old cordless dect phone (a couple of years old BT Freelance XD 500 as it happens) uses the outside two slots of the connector. The SPA3102 uses the inner two slots. Ho hum, off to the web to order 9 worth of wire adapters, most of the cost made up from carriage (BT to RJ11 so the phone can use it’s own wire to plug into the SPA3102, and an RJ11 to BT so I could plug the SPA3102’s supplied wire into phone line). Step 8: The instructions at this point became very vague. Well, actually, they didn’t exist (note to self, never again gasp in awe when technical instructions look simple). I had to log on to the Linksys web site to find answers of how to do things. As the device needs broadband to work, that’s not so big a deal but it would have been nice to have a PDF manual or at least where to go for a PDF manual. Receive a POTS (Plain old Telephone system) call – and ring my regular phone. There are hundreds of settings on this thing, but very little documentation. Without the Linksys web site I would have never been able to guess how to configure the dial string (so we dial #9 then phone number for POTS call). So, was it worth the 50 (+ wire adapters!)? Yes. I just wish they’d made the instructions more available. When sister sharon got married, the whole family flew out to celebrate with her and watch the big day. While around sister my fantastic parents paid for Rhonda and me to go in a helicopter flight around sydney. 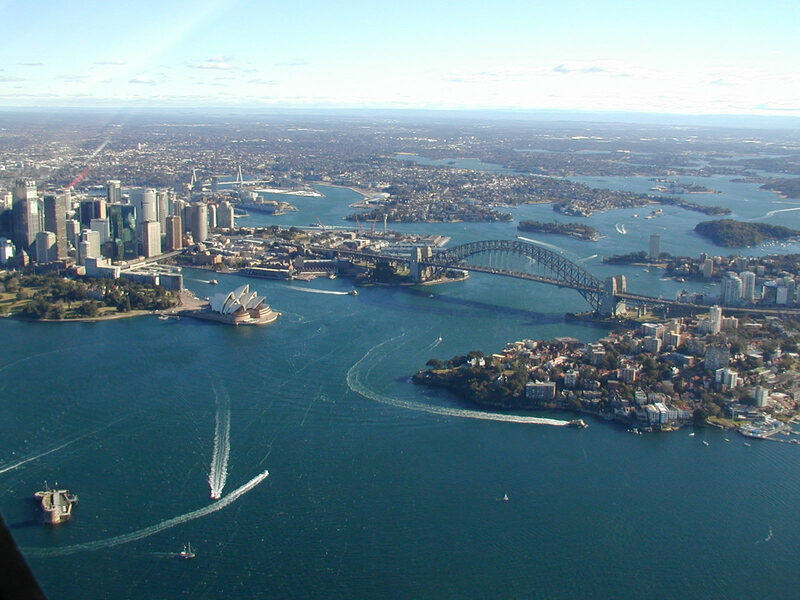 I’m not sure who took the photo (I think it was Rhonda) but we have a nice a photo of sydney harbour, opera house and city from the flight. I posted it in my Australia holiday postings and I just discovered it’s was posted as picture of the day on this persons blog. It’s a great feeling knowing things we do and share are appreciated. Was it 12 months ago already since last Christmas? Sure is, so Sunday was the day for the Roots Christmas party. As Root’s has grown our parties have gone from a small gathering at mum and dad’s house to international travel and superstars for the entertainment. Last year we hired a 70 seater coach and took everyone (at least, everyone who had a valid passport!) to Bruges for the day. Every year we like to do something a little special so this year we hired the upstairs restaurant of one of our favourite local pubs (The Red Lion, Hernhill) for Christmas dinner. Musical entertainment provided by the talented “Gez“… I have no idea what his surname is, but I do know he has a superb repertoire of music. He played at a big party we had this year to celebrate by Dad’s 60th (even his friends from Australia booked flights to join in) and he played a song I’d never heard before called “Roots” as well as one of my favourites “The JCB Song“. I was really pleased when Mum said she’d booked him for the Christmas party as well. I made sure I got a good view of how he plays. (I keep dreaming I can play guitar like he does one day… but I know I wont put the effort in to learn it!). Anyway, if you’re organising an event and are looking for a musician, Gez should be high on your list, just don’t book him for a day we want him please! We often book two entertainers and a few years ago Mum managed to get a Party Magician named Etienne. As you may have guessed from the name, he’s French. He’s also talented, performed regularly to members of the Royal Family, won lots of awards for his magic across Europe and he’s booked a long way in advance. When Mum said she’d asked if he was available I didn’t think he’d be coming. A few years ago he did a trick which left a playing card on the ceiling of my parents oast house (the part inside the cowl, that’s an apex roof about two stories high) with my dad’s signature on it. I’ve no idea how he did it, but my dad signed the card, put it in a pack that was shuffled and at the end of the trick the whole pack was thrown into the air and the one card stuck to the ceiling (think 6 metre high ceiling!) was the one Dad signed. 51 other cards floated down. The card is still stuck to the ceiling. His magic is impressive, but so is his personality. He arrives and quietly starts mingling with people and showing his magic, captivating everyone around him. My judgement on his impressive personality was what happened when we started to get everyone upstairs to the restaurant. Bear in mind this was a Sunday night in a pub that doesn’t normally open on Sunday nights. Almost everyone there was there with us but there was one family who just happened to stop by and be having a drink. Their children were amazed by Etienne and while all the Rooties went upstairs, Etienne spent a few minutes with them showing them some more magic. He didn’t have to, he could have had a few minutes break (I’m pretty sure he came to us having been doing his magic somewhere else), but instead he took a few minutes to entertain the children. A superstar in every way.